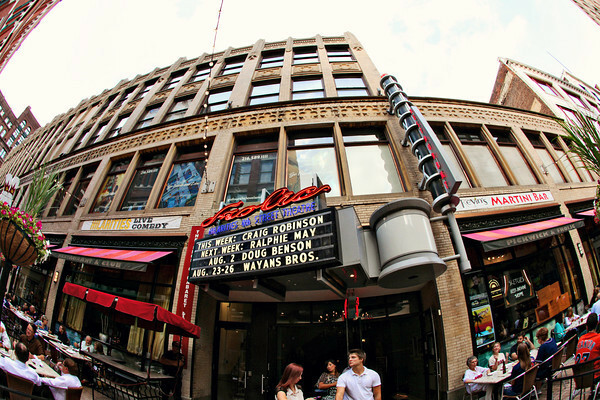 Pickwick & Frolic Restaurant and Club, “Home to Hilarities 4th Street Theatre,” is a complete entertainment experience. Pickwick features a 185-seat restaurant offering American rustic cuisine made from scratch! You can also find Kevin’s Martini Bar & Taproom, serving the latest and most innovative martinis in town. Dine outside on our patio if you wish or enjoy Pickwick & Frolic stage productions in our Frolic Cabaret. Entertain your corporate or social guests anywhere in our 27,000 square foot facility, including Cleveland’s only Champagne Bar and Hilarities 4th Street Theatre. 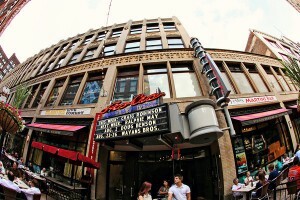 Hilarities, a 400 seat built-for-comedy venue complete with skybox loge seating, has been featuring the best in live national stand-up comedy for more than 30 years! Since our inception in 2002, Pickwick & Frolic has been honored with numerous awards and accomplishments. Guinness World Record holder for “The Longest Running Comedy Show” 52 hours of non-stop comedy! As with all aspects of this exciting complex, no expense was spared to ensure the highest level of guest comfort. Everything, from its unique décor to the custom made seating and select lighting, has been developed with guest comfort in mind. Pickwick & Frolic is a unique experience you will not find anywhere in Cleveland and perhaps, in the country. Pickwick & Frolic is your one-stop entertainment experience. You can move about the building experiencing multiple areas, fantastic food and entertainment and feel like you have visited several different places but you will have never left the building. 515 parking garage NO LONGER AVAILABLE! Due to our inability to control the customer experience and to not subject our customers nor ourselves to the unpleasant handling of parking and payment, we will no longer validate for the 515 Parking Garage on the corner of Euclid Ave. and East 6th Street. Parking is available through the valet on 4th street or CLICK HERE for alternate options. Charles Dickens, a wonderfully inventive comic artist, won his first literary fame with The Posthumous Papers of the Pickwick Club. Published in serial form, the monthly installments described the humorous adventures and misadventures involving a gallery of eccentric characters. In it’s day, The Pickwick episodes were described as having made the commonplace uncommon. Today, in much the same way, the Seinfeld episodes are described as “Much Ado About Nothing.” A little known fact is Dickens journeyed to America in the 1800s and on one of those occasions visited Cleveland. We like to think that when Dickens is in town, he visits Pickwick & Frolic. Pickwick & Frolic stands on the site of what was once The Euclid Avenue Opera House, built in the 1800s. For Cleveland, the landmark was the grand marvel of its day, frequented by thousands from across the region and beyond. Demolished in 1922, the S.S. Kresge Building was constructed on the site. Pickwick & Frolic, now located in this historic building, still boasts the original sandstone foundation of the Euclid Avenue Opera House that remains preserved along the left stage in Hilarities 4th Street Theatre inside Pickwick & Frolic. We consider this sacred ground’s providing live entertainment again on a site that once boasted some of the world’s best opera singers. Ironically, Pickwick & Frolic Restaurant and Club opened on September 6, 2002, exactly 127 years to the day the historic Euclid Avenue Opera House opened in 1875. Short Vincent, a street one block in length (like E. 4th today) between E. 9th and E. 6th streets, was once a colorful center of downtown Cleveland nightlife. The street was filled with restaurants and taverns. By the late 1920s, the local saloons, restaurants and other businesses became a gathering place for gamblers, sports figures, racketeers, lawyers and newspaperman. Short Vincent offered good food, underworld gossip and the odds on anything. It was home to such historical Cleveland landmarks as the Theatrical, the Taystee Barbeque, Frank Ciccia’s Barbershop, The Frolic Show Bar and Pickwick Restaurant. With all this history in mind, owner Nick Kostis liked the rhyming nature of the name Pickwick and Frolic. Remembering the history of Short Vincent, East 4th Street was the last location in Cleveland that could recreate the colorful live entertainment district from Cleveland’s past. Adopting the historic names of former Short Vincent restaurants and clubs and the fact the Dickens visited Cleveland, Nick decided that Pickwick would become known as our Restaurant and Frolic is what you do inside.